In the engine the con-rod is the connection between the pistons and the crankshaft and provides the transmission of power between these two components. DT® brand con-rods are manufactured using the most modern production technology and using the highest quality materials. To ensure the accuracy of fit of the two con-rod halves, there is a choice of manufacturing options, serration and cracked. Cracked con-rods ensure a more accurate fit and are widely used in modern vehicle applications. The con-rod is forged in one piece and then notched, by laser for example, at defined points. It is then, by means of fracture separation (cracking), broken at the predetermined break points. This results in a fracture microstructure, which produces a positive fit when screw-fitted. The con-rod is subjected to enormous material stress during the power transmission. Therefore, a 100% check of the dimensions, including circularity, alignment and rotation, is carried out by means of a coordinate measuring machine. 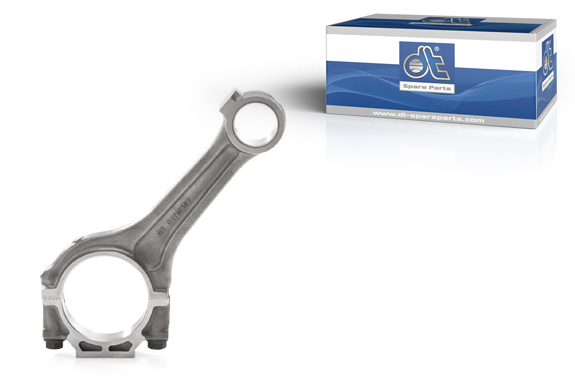 To ensure a vibration-free engine operation, the weight tolerances of the con-rods correspond to the original specifications.